Inaugurated in 1966 by former K-State President James A. McCain, the series is a tribute to Alfred M. Landon, governor of Kansas and the 1936 Republican Party nominee for President of the United States. 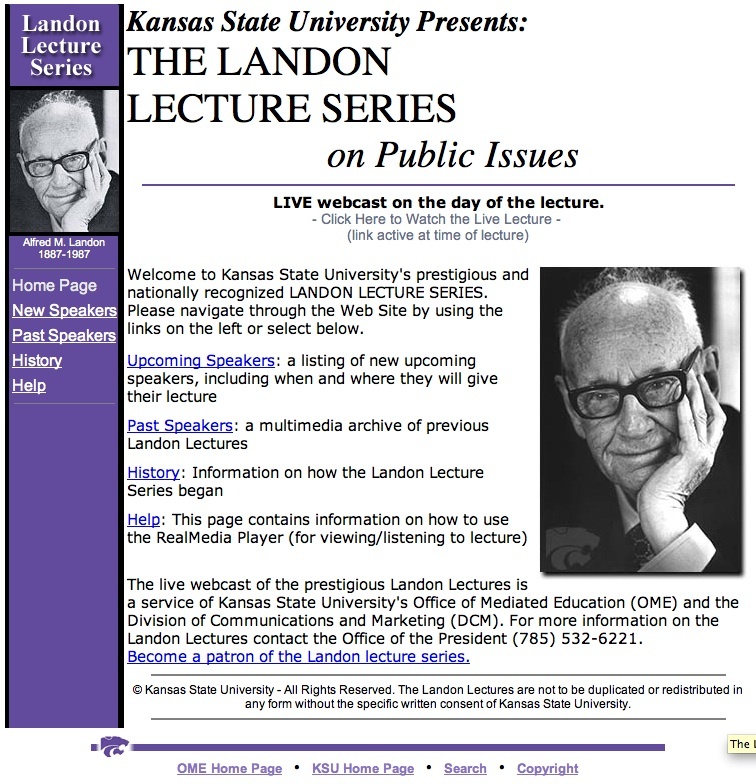 All the lectures are held in the university’s McCain Auditorium and are attended by Kansas State students, faculty and alumni, as well as the general public. The opening lecture, “New Challanges in International Relations”, which was given by Governor Landon, can be accessed in the site’s History section. The site hosts contributions from politicians – such as Ronald Reagan and Robert Kennedy, Bill Clinton and Mikael Gorbachov – journalists such as Bob Woodward – and key national and international figures, but no academics. A press conference is held after each lecture, to provide the lecturer with the opportunity to answer questions, and lastly the guest is invited to make a brief commentary with the lecture series patrons. Lectures from 1966 to 1995 are available in audio format; later ones are available as video, audio recording and text. A short biography of the lecturer is also available. The site is well structured and easy to use. The content is incorporated into the site and may be viewed in real media streaming and occasionally in flash video format.